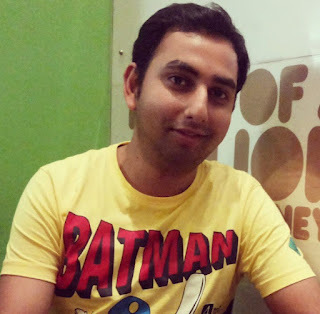 BLW: Let’s welcome the successful Indian newbie author Tapobrata Kumar to Book Lovers World. Tapobrata Kumar: Thanks a ton. It is wonderful to be associated with a project that deals with one of the most valued terms of my life “Friendship”. 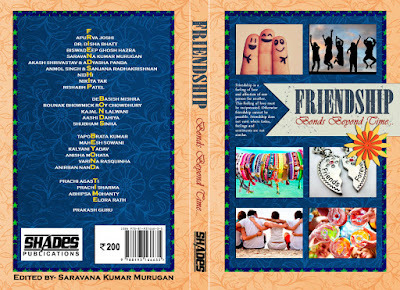 BLW: Firstly, congratulations on the launch of your book “Friendship- Bonds Beyond Time”. Tell us a little about yourself. Tapobrata Kumar: Well if I have to describe myself I would say: Proud Indian, Compulsive Dreamer, Accidental Banker and Aspiring writer, and in that order. In other times, I am foodie, movie-buff and ever playing the role of a friend. BLW: Tell us about your short story SOUL-MATES, what it means to you, and how did you feel when you saw your name in the winners list? Tapobrata Kumar: Well I will be honest and hope it doesn’t sound overconfident, but somehow deep within I had a belief that my story would be selected. That’s because the story is close to my heart. Which brings back to me your first question : Soul-Mates is about best friends : friends who knows each other inside out, friends who will stand for each other no matter what and most importantly friends who don’t need to speak always to communicate, they just know. It might sound a bit cinematic but trust me its real. BLW: Tell us about the characters of your story. Is it a character from your real life or just a piece of imagination? Tapobrata Kumar: There are essentially two characters in the story – Meha and Arjun, who were best friends but have moved on with life and how a situation brings them back together. The plot is purely fictional however characters are inspired from real life specially the bond between the two. BLW: What inspired you to write this short story? Tapobrata Kumar: Incidentally this is the first story I ever wrote and waited for a right moment to narrate it to the world. My real life bond with my friends is what transpired into this story. BLW: Do you like to dedicate your work? To whom will you dedicate and why? Tapobrata Kumar: I would like dedicate this work to my family, my cousins and my friends, who always inspired me to write, encouraged me and that is why I never gave up my dreams, despite being fully engrossed in an alternate full time career. BLW: What were your biggest learning experience(s) or surprise(s) when participating in online contests? Tapobrata Kumar: Well, not only me but a lot of blogger friends/writers have experienced a lot of unprofessionalism in this field. Writing scene in India is still evolving so it’s a learning curve for all. The biggest learning is choose wisely while you participate. BLW: Do you blog? Do you think blogging helps you in learning the art of short story writing? Tapobrata Kumar: Yes I blog at www.mymagicslate.blogspot.com . Well I don’t know if blogging helped in short stories or vice versa as I started blogging with short stories and then moved to other topics. BLW: When do you write the most? Is there a favorite place at your home or office where you write the most? Any props that you feel lucky to keep with you when writing? Tapobrata Kumar: There is no fixed time but mostly on weekends when I get time. Writing is like Yoga – whenever your mind is free of stress, heart feels positive and body bubbling with energy, it’s time for thoughts to flow. It’s my home sweet home that I do my form of Yoga. BLW: As a child, what did you want to do when you grew up? Tapobrata Kumar: I wanted to be a star, whom everybody knew and everybody loved to death. BLW: What are your inspirations in life? Tapobrata Kumar: My parents, my family, my friends and Sachin Tendulkar. BLW: What books have inspired or influenced you as a writer? Tapobrata Kumar: None. Real life incidents and personal experiences have inspired me to be a writer. Yes there is one poetry – Road Not Taken by Robert Frost and the short story The Last Leaf by O Henry really influenced me. BLW: What other secret skills do you have? Tapobrata Kumar: Let them be secret only. Lol !!! BLW: To be a good writer, one should be a good reader. We know you enjoy reading books. What are the best books you have ever read? Name any five. Tapobrata Kumar: Alchemist. Feluda stories by Satyajit Ray. Ignited Mind by APJ Abdul Kalam. Tintin Comics. The Arms and the Man by Bernard Shaw. These are the book which are vivid in my memory and hence probably the best I would have ever read. BLW: Message for the book lovers in this world! Tapobrata Kumar: You love the best thing in the world : Books. Keep growing your community and spread the seeds of love and knowledge. Thank you so much for your time, Tapobrata. It’s our pleasure to chat with you… And to the readers stay back for more. For the first time in BLW, we’re interviewing all the contributing authors of the book. We hope you will like reading the response. Stay Tuned!